From the smoldering ashes of a Matt Savage suit, something very good will rise. As the players who made Day Two of the World Poker Tour bestbet Bounty Scramble in Jacksonville took their seats in search of making the Final Table, renown tournament director Matt Savage was possibly simply searching for something to wear. Much to his dismay, but with his wholehearted consent, his cranberry suit, a debated about fashion faux pas that was beloved by Savage, was literally set aflame for a good cause. On September 19 a massive earthquake rocked Mexico, hundreds of citizens lost their lives and thousands were left without homes. Professional poker players Angel Guillen and JC Alvrado, as well as World Poker Tour personality Lynn Gilmartin, after seeing the devastation, knew they needed to do something to help. Together they started a fundraising effort to help bring much-needed supplies to the rescue and recovery efforts. However, in addition to the massive amount of need in a major metropolis like Mexico City, the trio thought that moving forward, perhaps one of the biggest challenges would be rebuilding in some of the smaller Mexican towns that were also in a state of ruin. Thus, Mexico Fuerte was born. Mexico Fuerte looks to raise funds to not only help rebuild shelters for all of those who lost everything in the Mexican towns of Morelos, Oaxaca and beyond but to do so in an environmentally friendly, sustainable way through the use of bio construction. To date, the endeavors of Mexico Fuerte have raised over $40,000 USD with their sights set on raising more so that they can bring back even more lost homes. That’s where Matt Savage comes in. Always sharply dressed when at the helm of any tournament, one of Matt’s more controversial choices in attire was his favorite glistening cranberry colored suit. However, not everyone was as enthusiastic about the wardrobe mainstay, including professional poker player Tom Hall. Hall, who wanted to see the suit burned on camera, offered $5,000 to Savage’s choice of charity (as well as $95 to replace the suit) if he would agree to incinerate the threads. Savage, who is wearing the suit in his Twitter profile, agreed to do it for Mexico Fuerte. 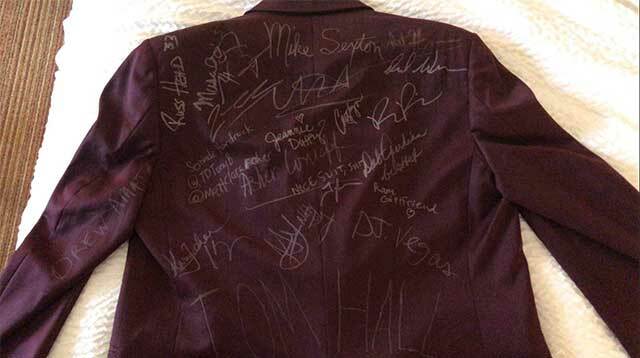 In an effort to raise even more money along the way, players were allowed to sign the back of the suit before it found it’s way to the furnace for $10 and $20 donations. At the time of ceremonial burning Savage’s suit and the generosity of the poker community raised $7,618, which will go directly to building a home for a family in Oaxaca. While the suit is now officially gone, the need for assistance in Mexico is not. To learn more about the mission of Mexico Fuerte visit their website at mexicofuerte.org.